The Brew Crew Series at Bad Shepherd is the Cheltenham operation's way of getting everyone on the staff involved in the brewery. And, as the series hits number 5, it's made its way into the office. There you find "office guru" Tracey whose instruction was: "Make me a beer that doesn't taste like beer." What did instruction turn into? 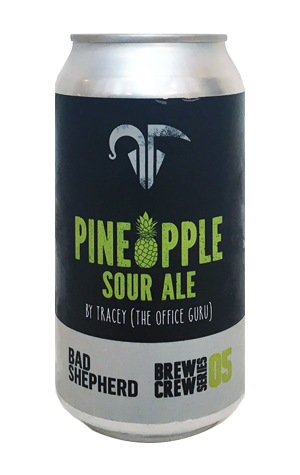 A pineapple sour ale that lands somewhere between a soft drink and a Margarita without the salt and tequila kick. It started out as a kettle soured beer with a healthy dose of wheat and oats before the brewers added 200kg of fresh pineapple. And what you get in your can is a cloudy pale yellow drink with distinct tropical fruit characters and a sourness that's more tangy than puckering: a beer that doesn't taste like a beer and an easy-drinking refresher at that.